So happy to see that you all enjoyed the fun E-Team Blog Hop featuring one of our favorite guilty pleasures (or daily must have)...Starbucks. The E-Team appreciated the time you took to visit their blogs and leave comments for them. Before I get to some winners, thought I would show you a quick photo of the 1st Starbucks location which is located at Pike's Place Market in Seattle, Washington. My family and I went up to Seattle for a wedding last summer so I insisted we visit the iconic place where it all started. 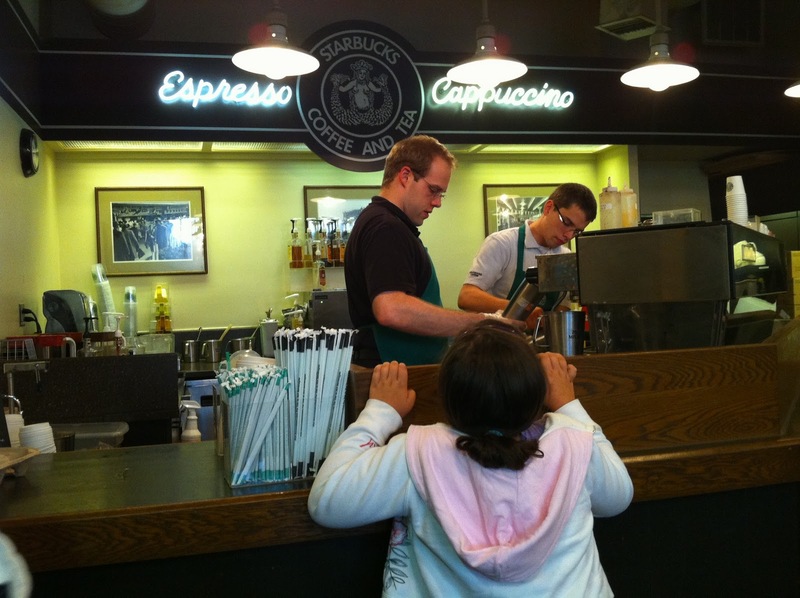 The Starbucks at Pike's Place is the only Starbucks that has the original brown logo with the original mermaid art. It's quite small but cozy and very historical. There are gift cards that are exclusive to this location as well as some other fun collectible mugs for the Starbucks collector. That's my youngest daughter taking a peak at the Barista's working away in the original location. Our visit made for some fun memories. Congratulations to the following lucky readers. You've won a $20 gift voucher to shop at eclectic Paperie. Please email you name to daisy@eclecticpaperie.com to claim your fun prize. You have until the next blog hop to claim your prize. Don't forget that this blog hop was also an eclectic Challenge issued to you. You have to incorporate some of the new Seasonal Distress Ink Colors and get a little inspiration form Starbucks. The challenge winner will receive a $10 Starbucks gift card along with a box full of eclectic Paperie goodies. You have until Nov 13th to upload your creation HERE. Hooray for the winner! Hooray for Starbucks! And, Hooray for eclectic Paperie!!! New Blog Hop: Part 3 - Be Merry!